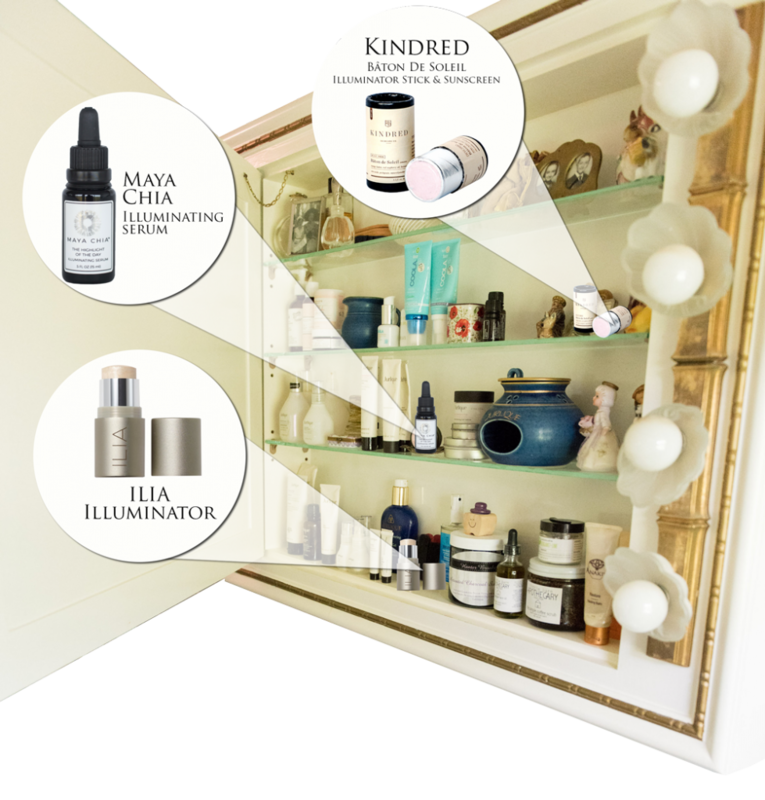 Maya Chia Illuminating Serum offers the world’s most nutrient-rich botanical treat in a super lightweight formula that comes in 3 different hues. Kindred Bâton de Soleil blends contain Nano zinc to create a chemical-free sun barrier. These illuminators are offered in a cool-toned pink, pearl, warm, golden, champagne, silvery Moonbeam and a bronze-golden glow. They are spectacular for adding dimension to cheekbones, brow bones, bridge of nose, or anywhere else. Mention this edition of Christina’s Cabinet at check-out and receive 10% off featured products! Come alive this holiday season with a super-charged facial for your transition from fall to winter. You’re just one treatment away from radiant skin with this botanical-based, replenishing boost. Revive dull, fatigued skin while reducing the appearance of fine lines. This treatment leaves your skin looking bright and you feeling rejuvenated. A 70-minute treatment complete with a personal organic skin consultation and a two-step takeaway gift product to continue feeding your cells with antioxidants, powerful vitamin-C rich kakadu plum extract and echinacea. Let us support you in putting your best face forward! Our newest add-on to the menu of options for Sweet 185’s Signature Organic Facial is the Radiant C. From an exfoliating bomb of Vitamin C to remove dry, dead, surface skin cells to an illuminating gel mask, which combines high-performance kakadu plum and sodium hyaluronate to calm, brighten and hydrate the skin, this is an add-on to any facial service that will leave you feeling – and looking – oh-so-radiant. Just in time for a bright new year! Pumpkins aren’t just great for carving or baking; they are a intensely rich source of potassium, zinc, alpha hydroxy acids, enzymes and free radical-busting antioxidants like beta carotene and Vitamins C and E. Also, organic pumpkin seed oil and fatty acids provide a nourishing, good-enough-to-eat treat for your skin. If you twice-baked yourself in the sun, dabbled in a few too many adult beverages or swam in a lot of chlorine this summer, or feeling on the dry side this fall, this is the treatment for you! 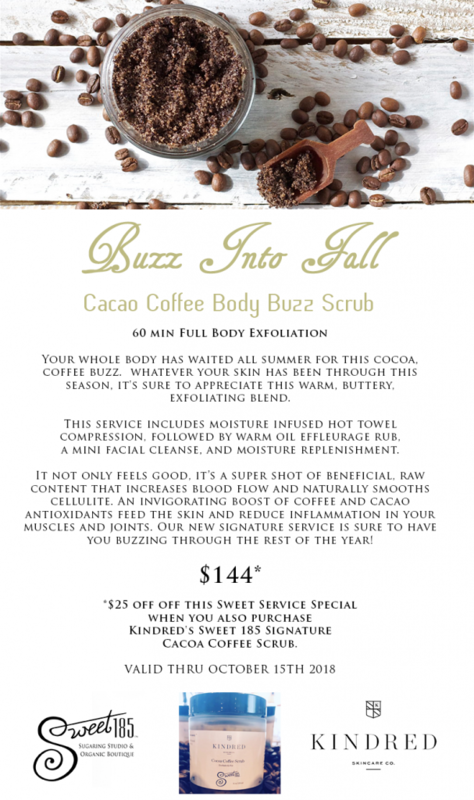 Your skin is warmed and stimulated with a specialized naked dry brush, followed by a moist, whole-body compress, combined with an application of soothing pumpkin oil. Your therapist then re-wraps you to make sure the nutrients are completely infused into your skin. But you are only halfway there. 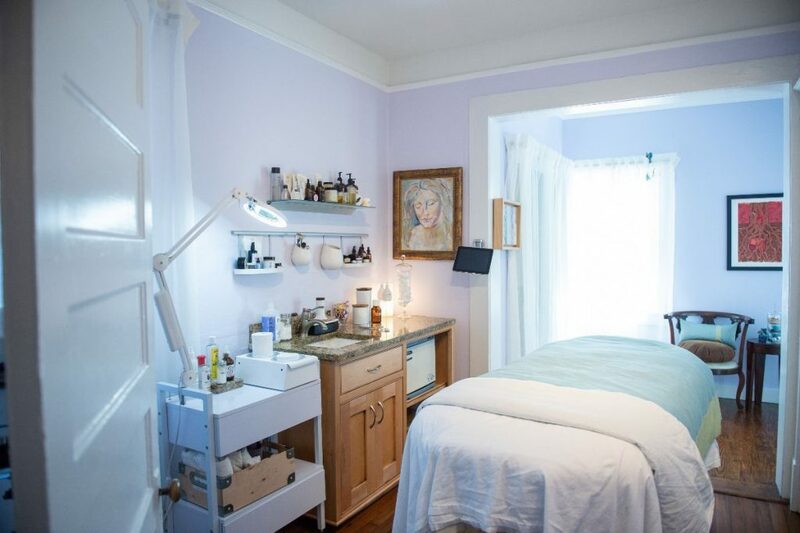 While you are cocooned in your wrap, your therapist will begin your facial. 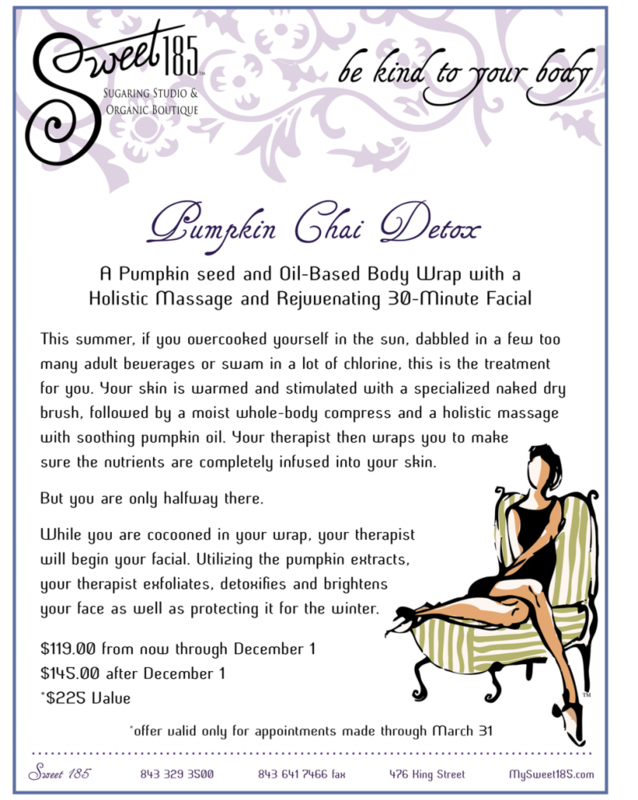 Utilizing the pumpkin extracts, your therapist exfoliates, detoxifies and nourishes your face. This treatment is a delectable, whole body experience, leaving you protected for the winter months ahead, from your nose to your toes! Purchase a gift certificate for ANY FULL VALUE SERVICE or FULL VALUE PRODUCT at $25 or more and receive a 2nd gift certificate for EQUAL VALUE at 50% of the cost! From our hair removal sugaring services to our signature facials, massages and organic skincare products, it’s our biggest savings to date and a limited-time offer. 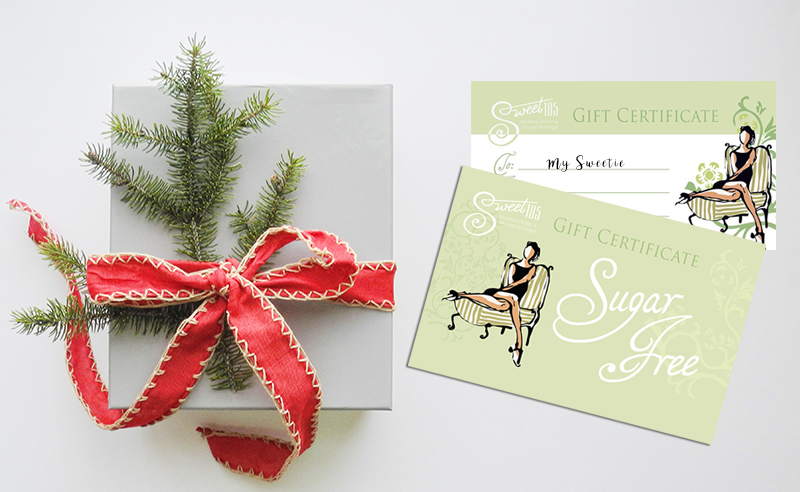 GIFT CERTIFICATES may be purchased in-person at our sweet shop located at 115 President Street, Downtown Charleston or ONLINE. When ordering online, we will contact you directly to coordinate the handling of your 2nd gift certificate for equal or lesser value. Gift certificate value valid through December 31, 2019. Gift certificates may be redeemed for any service or product at full value only. Excludes promotional services and sale retail items. Not to be combined with any other discounts. Additional gift certificate purchase must be for equal or lesser value. Gift certificates not redeemable for cash. Happy gifting! Utilizing Vegetable based tints to deepen and define your brow and or lashes. Clients report it lasts 2x longer than chemical based tint methods. Boost this service booking with an Organic 30/60/90 facial and give your skin the extra love it deserves. Face the world with brighter skin and boldness with your naturally defined brows and lashes! A perfect product pairing with this service is organic Lashfresh, to condition and hold bold tint colors longer and soften the brow and lashes to allow faster growth, greater fullness and to prevent breakage. Feed your lashes with an abundance of nutrients with this patented silk protein. A newly formulated sunscreen from Coola with additive protection from the damaging rays from technology, digital broad-spectrum. Most of us are surprised to learn about the damaging effects from devices we use each and every day. Offered in 30 SPF utilizing plant stem cells as the largest portion of ingredients to shield the skin. I also fell in love with the adorable dispensing wand, dropping out the perfect amount of product needed to avoid over use, avoiding clogging the pump and to keep product free from bacteria. Featuring a patented supercritical chia oil, this blend is a gentle cleanser for the entire face and eye area, pulling away makeup residue while dissolving impurities without drying this delicate skin. It’s a perfect double cleansing tool to prepare the skin for exfoliation. We’ve found it to be the best organic deodorant. No harmful ingredients to block pores and follicles, allowing the natural flow of toxins from our bodies. Kaia is extra sweet, offering complimentary products for those who need detox from chemical deodorants or a full body detox in general. It includes a charcoal detox bar to use when bathing as an added odor eliminator and to reduce perspiration. Our current assortment include these infusions: juicy bamboo, sakura blossom, black oak & bourbon and lime mint. With no baking soda, synthetic fragrances or other unnatural, irritating ingredients, clients are raving! The Goats Milk soap with attached Natural Organic Sea Sponge offers the best in natural skin care – powerful in it’s simplicity. Goats Milk has anti-inflammatory properties, is loaded with essential vitamins and is highly moisturizing, soothing dry and damaged skin. Goats milk helps us maintain our skins natural PH and is a natural source of alpha-hydroxy acids which rejuvenate skin. Sea sponges are eco-friendly, toxin free and hypo-allergenic with natural enzymes which prevent the growth of mold, mildew and bacteria. They’re excellent natural exfoliators, create a luxurious lather and are super durable. A hint of rose-gold sparkle created from high-performance, nutrient-rich botanicals created with the body in mind and infused with rich, exotic extracts of Jasmine and Coconut. 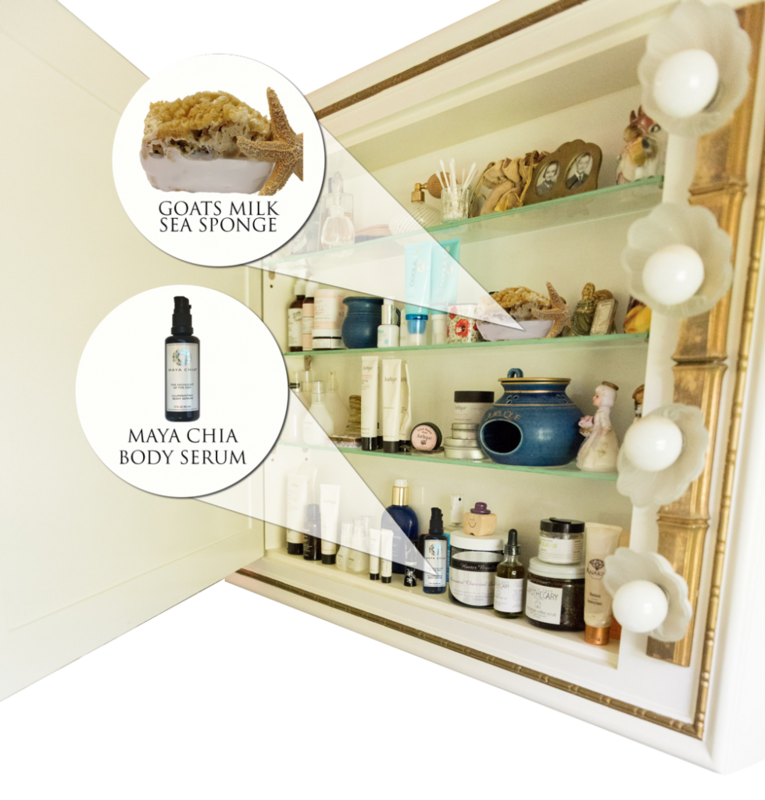 Mention you’ve read about these products in Christina’s cabinet for 20% off your first time purchase of this product. 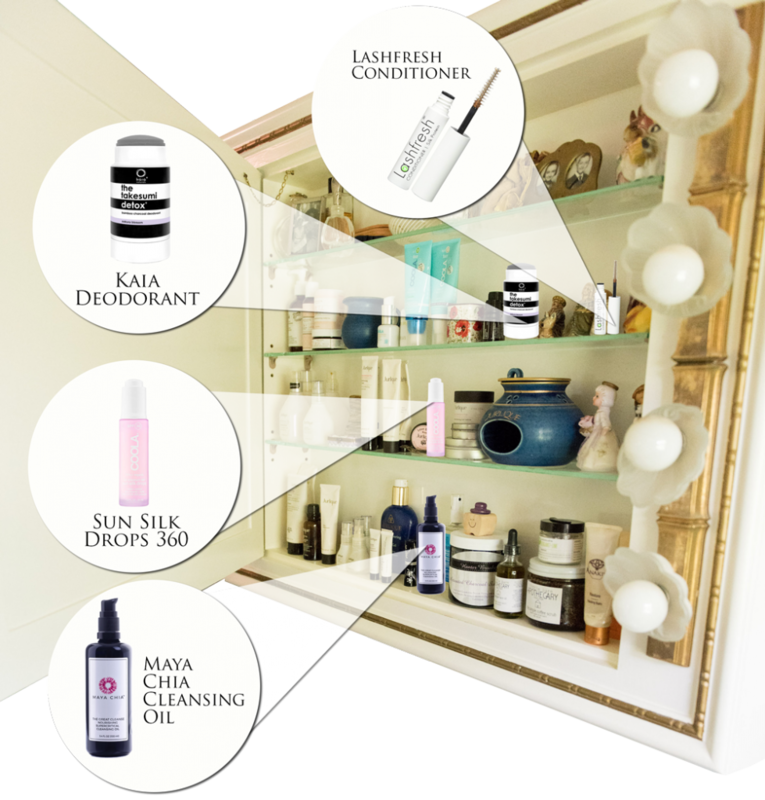 Did you know the ritual of caring for your skin is two parts: product and method? Most of us have had recommendations for products but have never had instruction on purposeful self-care ritual. “Get in bed” with Christina Mikolajcik-Edles of Sweet 185 Organic Sugaring Studio and Spa for an engaging, hands-on class showing attendees how to complete their day with effective product usage. This class is full of organics incorporating aromatherapy with individual, hands on time with Christina who has had over two decades of experience with organic self care. Smell, feel and see the benefits of proper technique of product usage and bring purposeful meaning as you end your day and say good night to your skin. 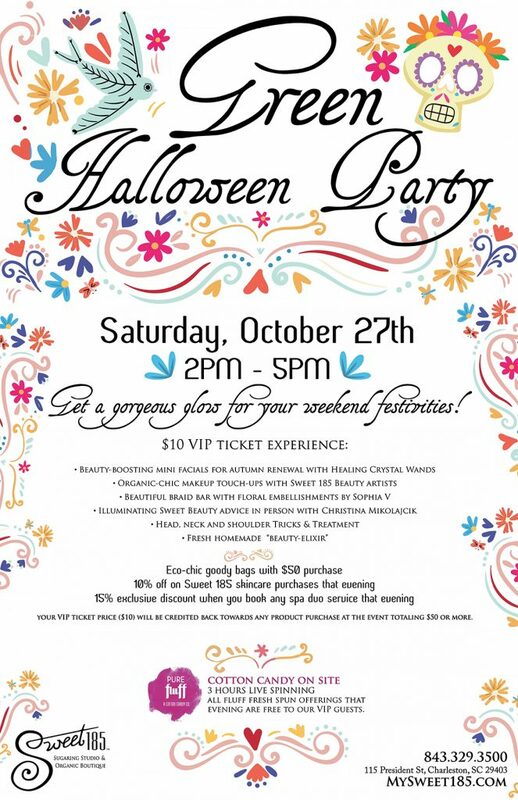 An Organic Product gift bundle (Value $75) is included in the ticket price.